Bigger, stronger, better—creatine monohydrate can help you do it all. 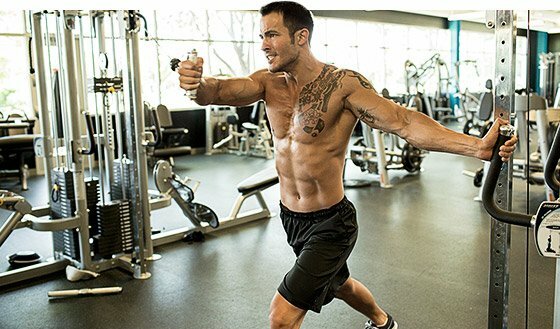 Learn how this muscle-building king can serve your fitness goals! For a long time, confusion surrounded creatine monohydrate. Like football players on a fumble, everyone wanted a piece of the ball. But supplement users and companies had questions: is creatine safe and effective, or is it dangerous and over-hyped? I'm Layne Norton, a natural pro bodybuilder and Ph.D. in Nutritional Science. With my background, I can cut through the bro-science and bring you the true science. Let's clear the field and get to the core. Creatine monohydrate is one of the most heavily researched and widely debated supplements available. Ever. It's also one of the most effective. Learn what it is, how it works, and why you should be using it. Let's start at the top. Creatine mono isn't some super-chemical created by a bodybuilding Tony Stark. It's actually an organic acid found naturally in food, and it exists in significant quantities in meats like beef and fish. Creatine is nitrogenous, which just means it contains nitrogen, and is made from a combination of 3 amino acids (the building blocks of protein): glycine, methionine and arginine. In humans, approximately 95% of creatine is stored in skeletal muscle where it exists as creatine phosphate and can donate its phosphate molecule during certain metabolic processes. We'll discuss the importance of this in greater detail below. If you're wondering whether you can benefit from creatine supplementation, consider your fitness goals. Creatine is primarily for people who are looking to maximize muscle, strength, and/or performance gains. So, if you're trying to get bigger, stronger, and maybe even lift longer and heavier, creatine can help. If you're not trying to do any of these things, go take a nap and come back when you're ready. Creatine supports these goals because it can be used as a source of energy for anaerobic work, which includes high-intensity weight training and cardio work like sprinting. Supplementing with creatine has been shown to significantly increase the concentration of creatine in muscle. Remember that—in muscle—creatine is found as creatine phosphate and can act as a phosphate donor. Our body's energy currency—a molecule called Adenosine Tri-Phosphate, or ATP—used phosphate to power certain cellular processes. During exercise (and other activity), ATP is broken down to Adenosine Di-Phosphate (ADP), where it loses one of its phosphate molecules. The loss of this phosphate essentially provides the energy to power your cells during any activity, including exercise. "Supplementing with creatine has been shown to significantly increase the concentration of creatine in muscle." As your ATP stores become depleted, performance can suffer. Creatine phosphate can help restore ATP by donating its phosphate to ADP to reform ATP. In this way, creatine can help improve performance and has also been shown to increase strength and power. While all this performance and strength stuff sounds great, I'm sure you may be wondering what creatine will actually do for your body. Creatine has also been shown to increase lean body mass, mostly through increasing the fluid content of muscle cells. While this may seem like an 'artificial' increase in lean body mass, keep in mind that muscle cells that are better hydrated are also more anabolic. Additionally, creatine has been shown to increase the activity of muscle satellite cells, which may increase the overall capacity for long-term muscle growth. Every few years, it seems like the latest and greatest form of creatine comes out. Creatine monohydrate is the most common and the most studied form of creatine on the planet. It has proven its worth in research time and time again. Nonetheless, many other forms of creatine exist—too many to name here—but none have shown the consistent results of creatine monohydrate. Fortunately for you, creatine mono is generally the least expensive form of creatine available, so it's good for the muscle and the wallet. There are two traditional ways of taking creatine monohydrate. You can take 3-5g per day (depending upon muscle mass), which will saturate your intramuscular creatine stores in a few weeks. Or, you can load creatine at 15-25g for the first 4-5 days, which will saturate the muscle cells more rapidly. While loading saturates the muscle cells faster, the downside is that you do not assimilate the majority of that creatine, so people on a budget may consider it wasteful. Many people consume creatine post-workout since it's been speculated that taking creatine after training will lead to better uptake of creatine into the muscle. In all likelihood, however, this is splitting hairs. Consistent supplementation of creatine at 3-5g per day has been shown to saturate muscle cells, mostly regardless of time consumed. Therefore, I suggest consuming your creatine whenever it's most convenient. Creatine has been shown to work synergistically with both beta-alanine and HMB, so users who want to maximize creatine's benefits should consider supplementing with those products, as well. Of course, your usual supplement foundation of a multivitamin and protein—whey and/or casein—still applies. As a rule, I recommend purchasing supplements whose maker can provide lab analysis of the products. This ensures that what's on the label is actually in the bottle. Based on current research, it appears that creatine monohydrate is the most effective creatine product available on the market today. If you are going to spring a few extra dollars for anything, then go for a micronized form of creatine monohydrate to improve mix-ability. Other Sides To The Story? "Creatine monohydrate is the most effective creatine product available on the market today." When creatine was introduced to the market as a supplement in the early 90s, many anecdotal and theoretical side effects were brought up as potential concerns—including kidney and liver problems, dehydration and cramping. Thus far, short- and long-term research studies have demonstrated no side effects of recommended creatine use on kidney, liver and/or the heart. Additionally, creatine has not been shown to increase the incidence of cramping. There is some evidence that creatine can increase dihydrotestosterone levels. Some have theorized that this may cause an increase in acne, but this has yet to be demonstrated. Finally, strong anecdotal evidence exists that some users may experience gastrointestinal distress when loading creatine. This is likely caused by excess creatine intake exceeding the GI tract's capacity to absorb it, which could lead to gas and cramping due to the unabsorbed creatine. If you experience GI distress during creatine loading, try reducing your creatine intake until you reach a comfortable level of intake. Alternatively, skip loading entirely. Finally, if your physician has advised you against using creatine, then you should avoid it. The bottom line is that creatine is one of the most effective and affordable supplements on the market today. I suggest it for anyone looking to improve muscle mass, strength and performance. Forget the fumble of misinformation. Now that you know the facts, you can grab the ball and claim your creatine. Ask The Supplement Guru: When Should I Take Creatine? Creatine is here to stay, but gym-goers continue to bicker over the best way to take it. You'd better believe that Jim Stoppani has an opinion on this pressing supplement debate! When do you take creatine: before a workout, after, or any old time? Is the difference between them as great as some in the gym will have you believe? The answer might surprise you.